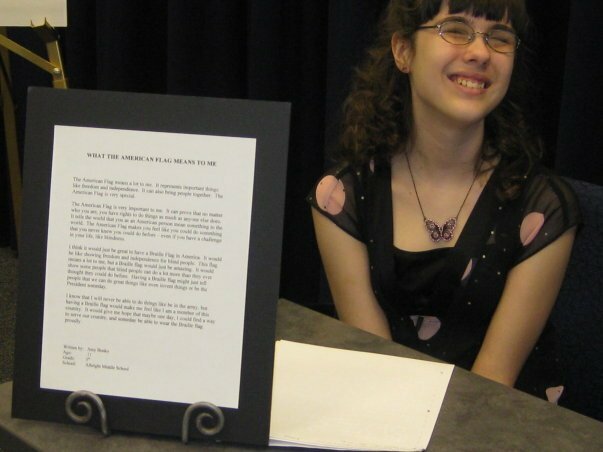 Along with the Blind Service Association and the Chicago Mayor's Office for People with Disabilities, Kansas Braille Transcription Institute recently sponsored two essay contests, one featuring blind and visually impaired students, and the other featuring sighted students. 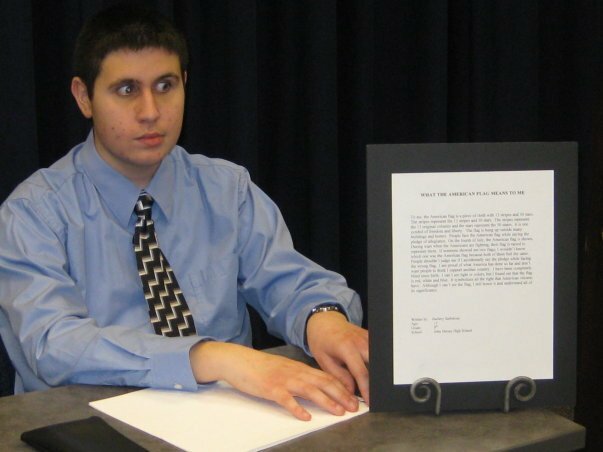 The contest involved the students submitting essays about what the Braille American Flag means to them. Essays were written by students from Walter Payton College Preparatory High School, James B. Farnsworth Elementary School, Metamora Township High School, Allbright Middle School, Adlai Stevenson Middle School, John Hersey High School, and Curie Metropolitan High School. 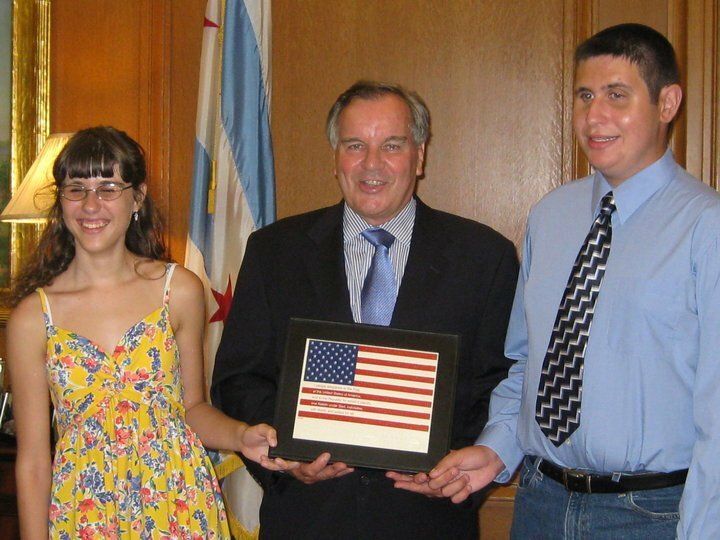 A ceremony introducing the Braille American Flag was held at Chicago's city hall on February 22, 2010, with the blind and visually impaired students included as guests. A second ceremony involving the sighted students was held on March 22. The contest winners, Amy Bosko and Zachery Sarbekian, were announced at these events, and the students were invited to read their essays. 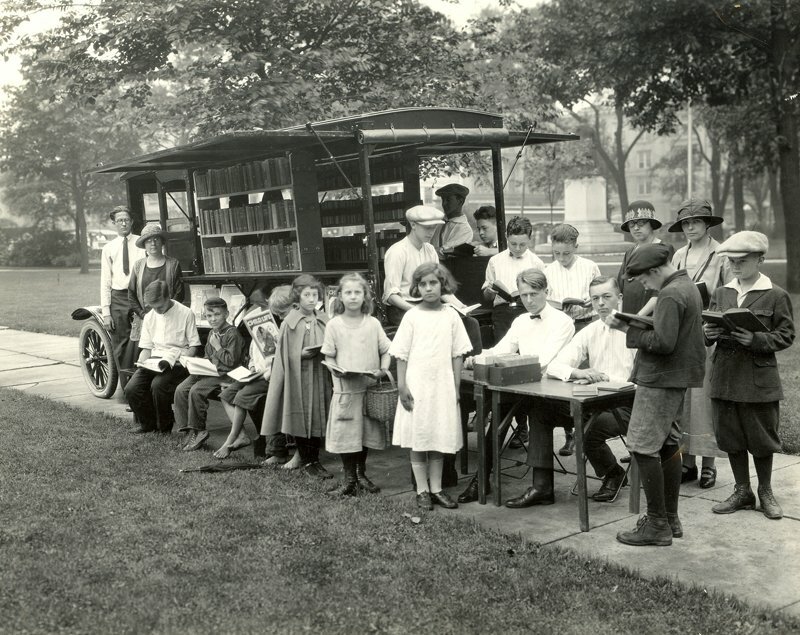 Throughout history, bookmobile founders have often had a similar goal — bringing literacy to the masses. 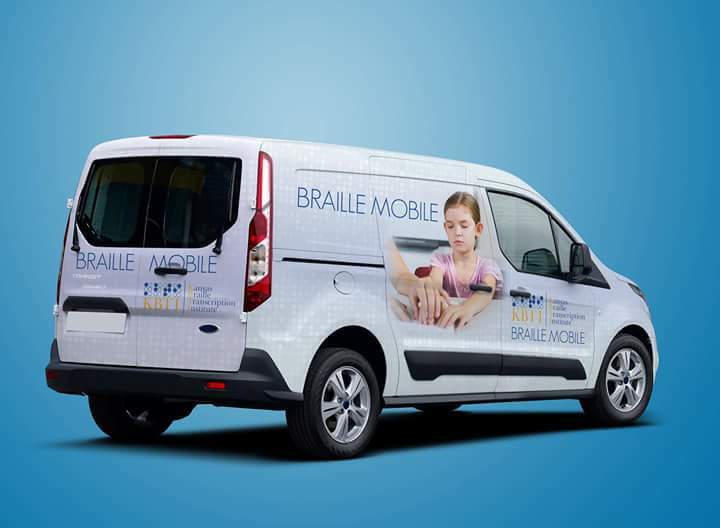 KBTI introduces the nation’s first Braille Mobile! Within the greater Wichita area (to begin with) the Braille Mobile will distribute children's books to schools, learning centers, libraries, hospitals, and homeschooled blind students. The books will maintain all text, color, and illustrations, in braille and tactile graphics where appropriate, at NO Charge! Area authors' of children's books will be invited to submit their works for consideration. If chosen, their books will ultimately be reproduced to Braille and distributed as described above. Selected authors will be featured on the KBTI website and other social media outlets. One such book already reproduced to Braille is: "You're Too Big To Think Small" written by Ron Baker, Wichita State University Basketball Great, now playing for the New York Knicks! Area celebrities, elected officials, even chosen authors themselves we will be invited to participate in readings of selected titles at a variety of locations, or appear at established events. To be a part of this history making project, contact any author of children's books you might know and tell them about this project. That's a good place to start. Invite your friends and family to participate. Inquire of local establishments if they provide printed information in alternative formats, i.e., Braille, large print, audio. Let them know KBTI does, efficiently and inexpensively. 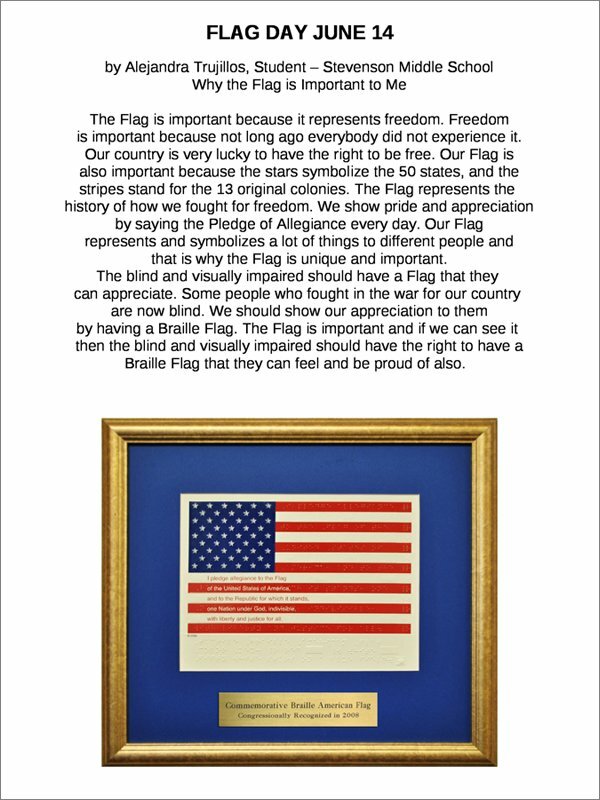 Ask local establishments to prominently display a Tactile Braille American Flag in support of this project, and direct them to kbti.org to obtain one or more. Gets Major Boost at first council casino! 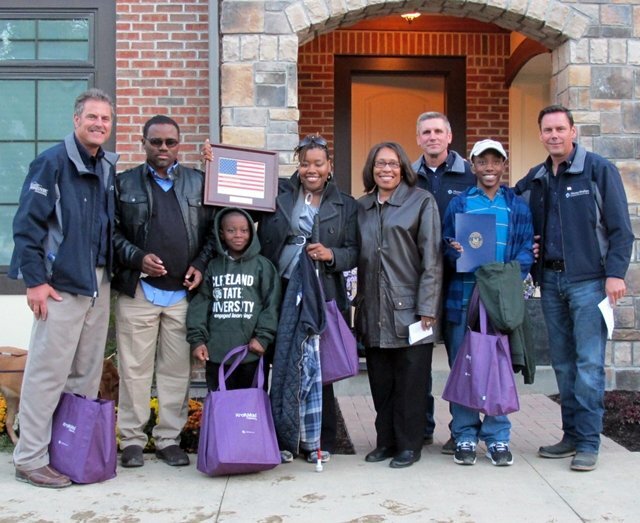 On June 20, 2014 KBTI Director Randolph Cabral and James Chamberlain were honored to personally present a Braille American Flag to two of Americasâ most loved country music entertainers, Mr. Tracy Lawrence and Mr. Ronnie Milsap! The evening and crowd grew in excitement when both men were invited ON STAGE to present the Braille American Flag to country music legend, Mr. Ronnie Milsap! With such declining numbers as one of ten blind students in America becoming Braille literate, we believe support from Mr. Milsap, a Braille reader, and successful entertainer can serve as a major boost to our Nationâs blind youth! Mr. Milsap began learning Braille at age 6, and music at age 9. He became country music's first successful blind singer, and one of the most successful and versatile country "crossover" singers of his time. He is credited with six Grammy Awards and forty No. 1 country hits. He was selected for induction into the Country Music Hall of Fame in 2014. Braille American Flag Monuments Officially Arrive At The National September 11th Memorial And Museum! Two bronze Braille American Flag monuments have successfully arrived at the National September 11th Memorial and Museum for permanent display by all New Yorkers and visitors to that great city! Until the museum is officially opened one of the monuments will be included in the museums traveling display to schools and other locations. The monuments were made possible through the generation donations of the Joanna Troutman NSDAR Chapter of the Daughters of the American Revolution located in Magnolia Texas. The event was organized by Sharon Sharman Russell DAR Chapter Regent and Alexandra Drakakis, Assistant Curator of Collections of the National September 11th Memorial and Museum. 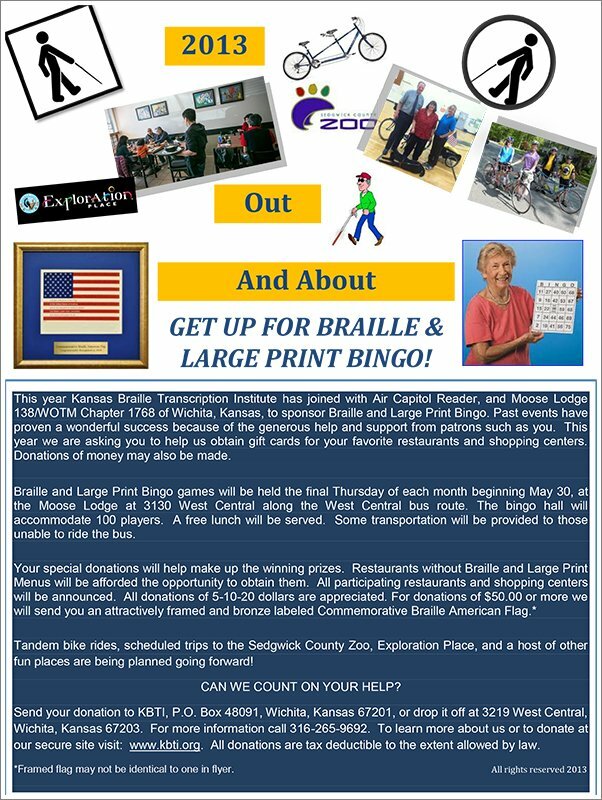 To learn how you or your organization can participate in an event to have a Braille monument located at a place of your choosing, or at a national site, please contact us at info@kbti.org, or call us at 316-265-9692. Since its founding in 1910, the Boy Scouts of America has had fully participating members with physical, mental, and emotional disabilities. James E. West, the first Chief Scout Executive, was a person with a disability. Last year our Institute received copyright permissions from the American Boy Scouts to produce Braille versions of its Anniversary Handbook and all other requested literature and publications. We are pleased to announce a Braille version of the Anniversary Edition of the Boy Scouts of America Handbook is now available for orders! 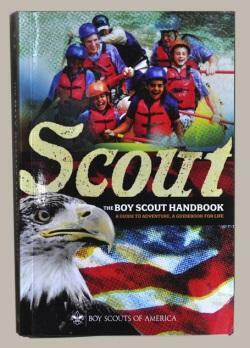 The Handbook is still the go-to book for every Scout, but now with more information than ever before. (To order a copy, please visit our Store page). Ask about a print with Braille version if you are interested in reading along with your Scout. The Robert J. Dole VA Medical Center and KBTI have joined to offer paid training and employment to disabled and homeless Veterans. If you or someone you know is a service connected disabled veteran you may be eligible to receive paid training, followed by full time employment. Training and employment involves learning Braille transcription, and assistive technologies. Some qualified candidates may also be eligible for housing and other benefits. To learn more call us at 316-265-9692. (Wichita, Kansas area only). Senator Bob Dole accepts Braille American Flag from KBTI Director, Randolph Cabral, May 14, 2014 at the Wichita State University Metroplex. For anyone residing in or visiting Wichita, Kansas, be sure to make a special trip to the Robert J. Dole Veterans Medical Center, and to the Veterans Memorial Parkto experience our great city's Braille American Flag monuments. The Kansas Braille Transcription Institute, Inc. is a non-profit corporation dedicated to serving the visually impaired through the operation of an innovative Braille transcription center. We provide our transcription services to anyone looking to have their work transcribed into braille. 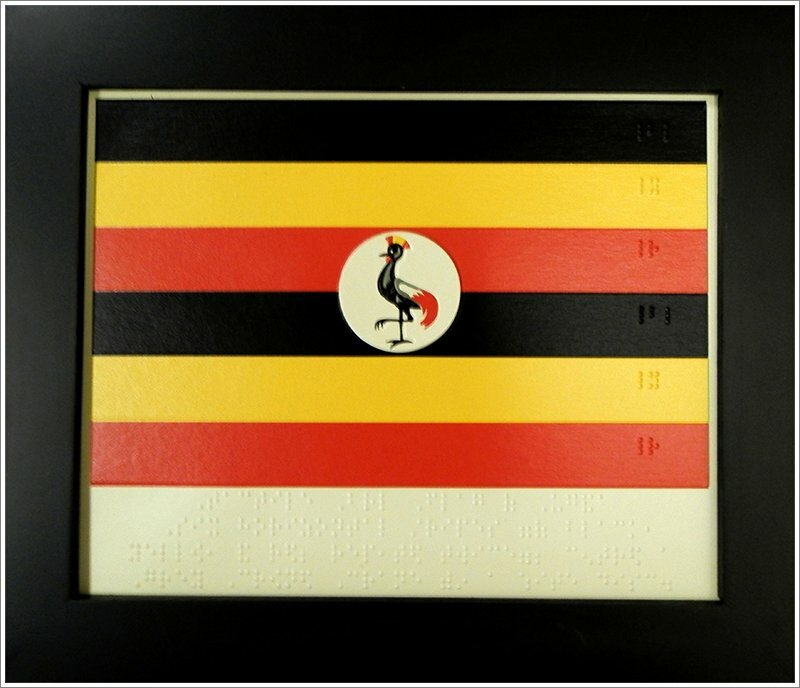 With more than two decades of experience in the industry, you know you can trust our organization to provide you with the best Braille services. Brailling the landscape one dot at a time! 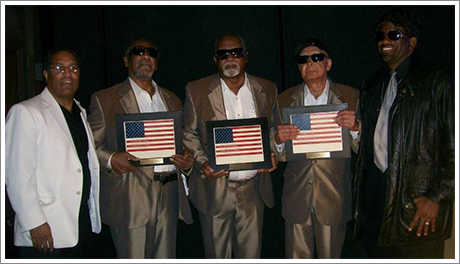 Blind Boys of Alabama are a five-time Grammy Award winning gospel group from Alabama. They first sang together in 1944. Since then, the group's output has spanned seven decades of tours and appearances, and produced a successful discography. Since their formation, Blind Boys of Alabama have made it their self-proclaimed goal to "spiritually uplift audiences". The gospel group has been a source of inspiration for those with disabilities. In the words of one of the groupâs blind members, Ricky McKinnie, âOur disability doesnât have to be a handicap. It's not about what you can't do. It's about what you do. And what we do is sing good gospel music." restaurants: Auntie Maes, Riverside Cafe, El Mexico Cafe, IHOP, Felipe's Jr.
New prizes are being added regularly! 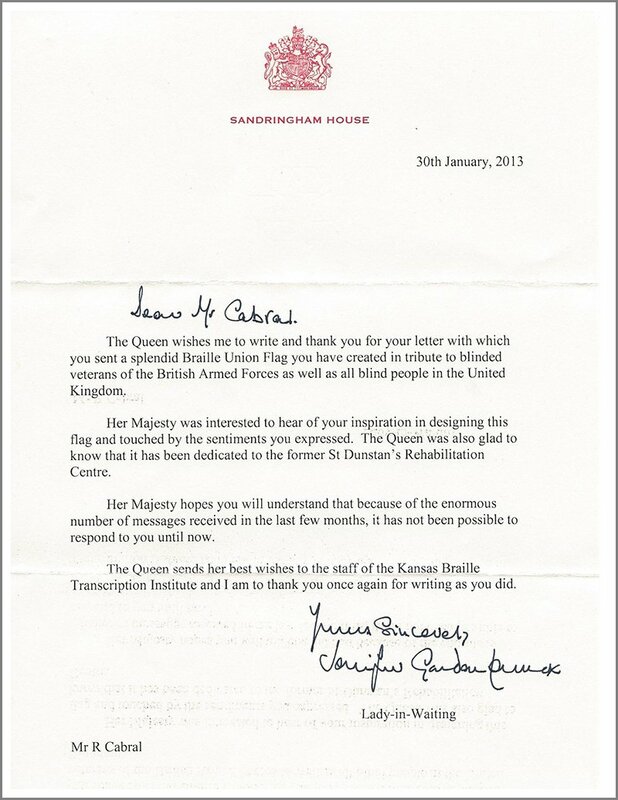 Following creating and presenting the Braille British Flag to several blind Veterans of the United Kingdom, and the formerly St. Dunstan Rehab Centre that includes a blind rehabilitation and training unit for ex-servicemen and women, it seemed only appropriate to send one to Her Majesty the Queen. She was most gracious in her response. Learn more about Kansas Braille Transcription Institute in Wichita, KS and find out why we are the Braille transcription institute of choice. 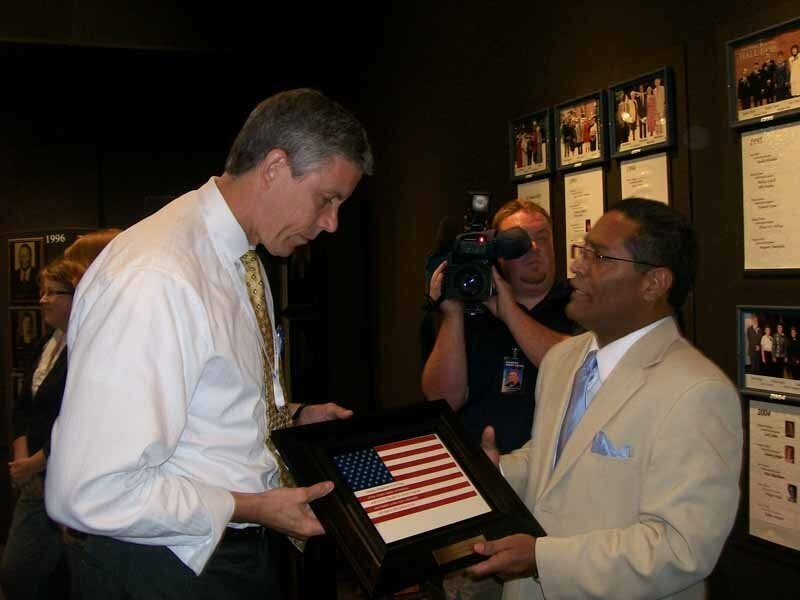 In January of 2011, Johnny McKenzie, a former commander of American Legion Post 184 in Savannah, Georgia presents a framed Braille flag to Walt Peters. 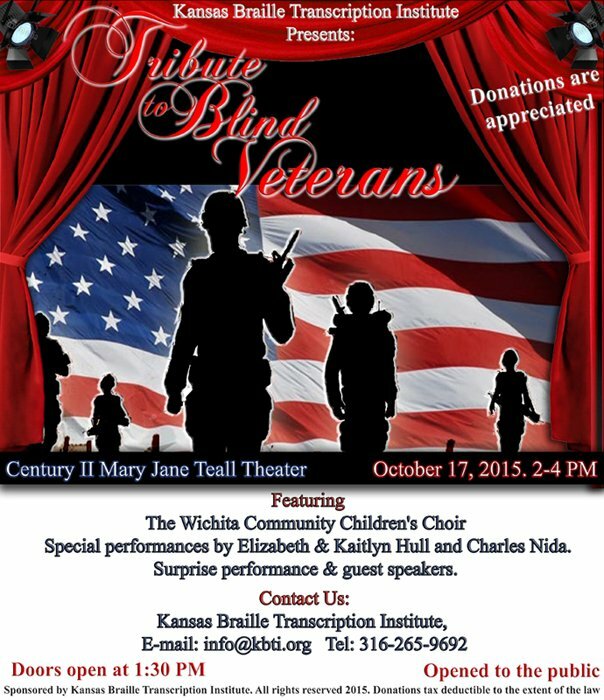 The Kansas Department of the American Legion endorses the Braille American Flag! One for the need of many is a code livedout by veterans across America. 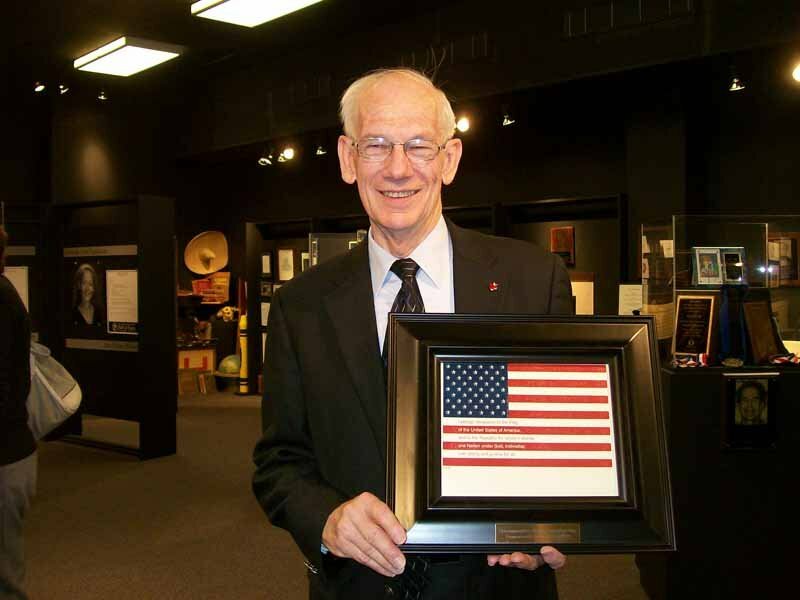 In this same spirit, KBTI has recently receivedsome long-awaited and much-needed help to make it possible for millions of blind Americans to see our nation's flag. 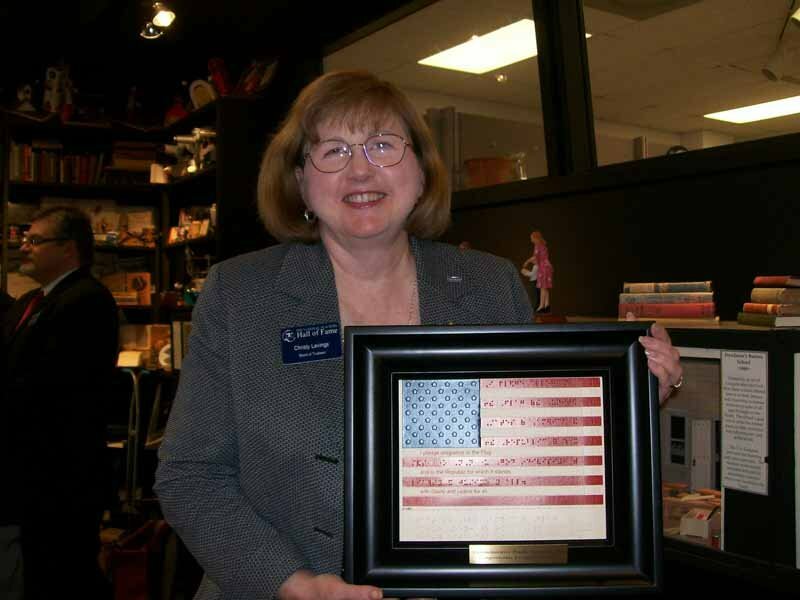 The Kansas Department of the American Legionhas officially endorsed the Braille American Flag. This paves the way for the Flag to be endorsed by the American Legion at the national level, during the Legion's upcoming National Convention in late August. Extreme Makeover: Home Edition recently built an amazing home for Andre and Jasmine Anderson and their two sons Jaison and Jaihzon. Andre is totally blind, while Jasmine has low vision in one eye and none in the other. The Andersons have overcome their own challenges to create a foundation to help people learn about dealing with people with disabilities. Ted Gertz, President of BlindService Association: This day is a very historic day not only for people who are blind and visually impaired who live in Illinois but for all ofIllinois in recognizing the importance of the Braille American Flag to over 1.3 million blind and visually impaired citizens over the age of 25 in the United States. 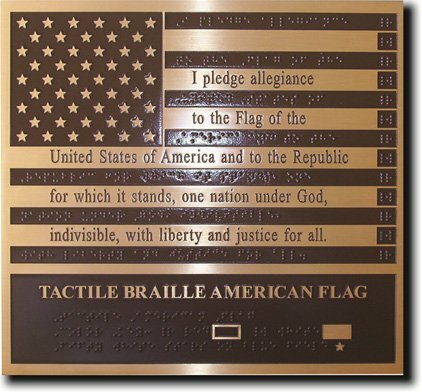 In 2008, the United States Congress passed the Braille American Flag Memorial Act authorizing the installation of the American Braille Flag as a bronze monument at Arlington National Cemetery. This definitely meanta lot not only to blind Americans but to blind veterans of all wars who havegiven so much of their lives to keep the United States safe. When Blind Service Association was approached by Randolph Cabral, who is not only the creator of the braille flagbut also the Executive Director of Kansas Braille Transcription Institute, asking if we could help him to introduce the flag in Illinois not only were wehonored to do so but felt it was part of Blind Service Association'sresponsibility to bring awareness to the people of the State ofIllinois of something as important as the braille flag. 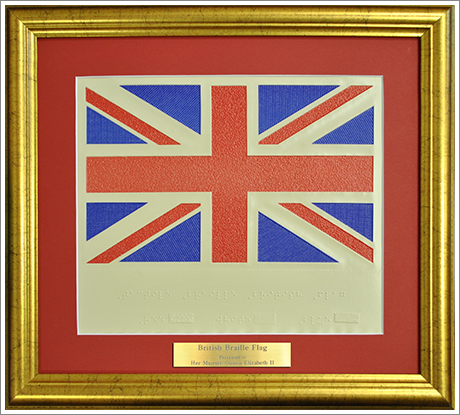 In the next few days we received one of the flags from Randolph which was shared at the next BoardMeeting. A long time Board Member who is an attorney and happens to be totallyblind summed it up best when he related that he knew there were thirteen stripesand 50 stars to the flag, but he had no idea how the stars were laid out. 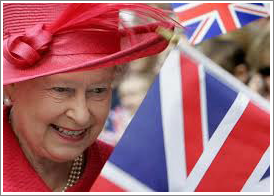 Forthe first time in his life he was able to really see the flag that had meant somuch to him. Soon we contacted The Mayor's Office of People with Disabilitiesand they, too, were as committed as we were. It is Randolph Cabral's intention to introduce the braille flag to all 50 states of the U.S. President Obama hasofficially recognized the braille flag and if you go to the Kansas Braille Transcription Institute's Web site at KBTI.org you will see a picture ofPresident Obama holding the Braille flag. The state of Illinois will now jointhe states of Kansas, Nebraska and Missouri in recognizing this monumentalmoment in history. A lot of people deserve to be thankedtoday for making this event possible. They are Randolph Cabral from the KansasBraille Transcription Institute, Mayor Richard M. Daley, Commissioner Karen Tamley, Deputy Commissioner Joe Albritton, Melissa Stratton, Margaret Lastick, Kirk Miller, Tim Paul, Debbie Grossman, Karine Rosvold, Allen West and thejudges of the essay contest Art Shapiro, Reva Hairston and Beth Finke. Check out the services that we can offer you.